New York Fashion Week took place late last week and through the weekend, and the fashion elite were all in attendance, as were many celebrities. I've been going through the collections and pulling some fantastic pieces to share with you all. I have to split it into two posts because there are so many looks to feature! Love this piece, it's feminine and flirtatious with an edge. The geometric shapes, lace cutout, and bold embellishments make it perfect for the red carpet or in an editorial spread. I love these playful dresses with the mid-thigh hemline. Both are monochromatic with peek-a-boo layer of white underneath. These pieces feel both bold and sweet, and I'm definitely a fan! Monique L'huillier's gowns have me floored. These are so beautiful. The colors so rich, and the material so airy and ethereal while still being perfectly formed to the female silhouette. I love the delicate lace neckline on the top piece, and the ombré coloring in the burgandy piece below. Her designs take my breath away, and that is why she is always one of my favorite designers. Tadashi Shoji makes me want to be the lady I only sometimes am, much to my mother's chagrin, lol. How lovely is the color, shape, and pattern on this dress? 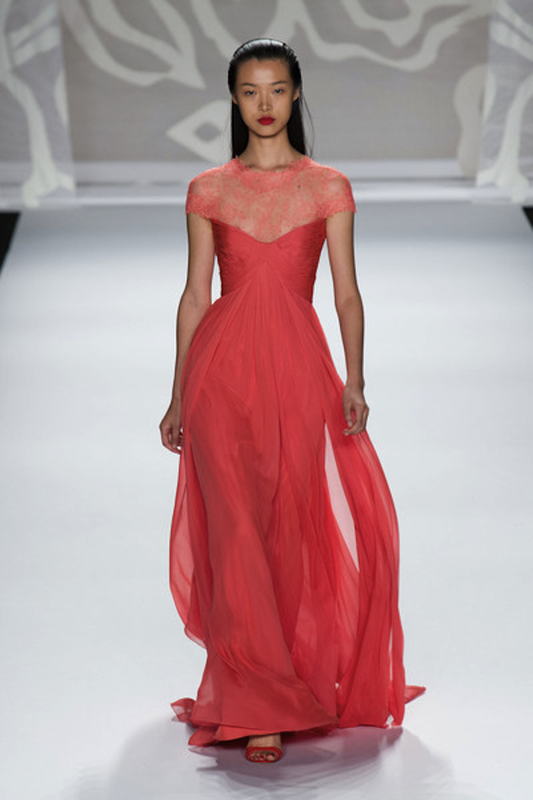 The cut is immaculate, and Tadashi Shoji is known to make dresses that fit a woman's body like a glove. This dress makes me want to go to tea! I know this piece is weird and fashion-y, but I just love it. It's definitely editorial material, and it's cool as hell. Plus, I love the ruffled socks in the open-toed sandals. No way could I ever pull that off myself, but I love seeing it on the runway. I'm choosing to ignore the shoes, but I think that we will see this piece on a red carpet sometime. The skirt will probably be hemmed to above the knee, but I know some young starlet (or Gwyneth Paltrow) is going to do this look. That's all for today loves, which pieces/collections did you guys love from NYFW!? I'll have Part 2 up Wednesday! Blush and Bangs is a blog by Kayla Barr - Actress. Writer. Funny Girl. Join the site and follow me on Instagram and Twitter for daily shenanigans!